Members of the Working People’s Alliance (WPA) during this morning’s meeting with President David Granger at State House. A Partnership for National Unity (APNU), the larger component of the governing coalition, is set to hold its first meeting since winning general elections two years ago, but already President David Granger says it is the responsibility of party representatives in government to report back to their executives. Likely to feature in next months meeting of A Partnership for National Unity is whether the Working People’s Alliance should be given a separate ministry. In talks sparked off by the reassignment of Dr. Rupert Roopnaraine from the Ministry of Education to the newly established portfolio of Minister of the Public Service, the WPA expressed its long-held grave concern about APNU’s Councils failure to meet since May 2015. WPA Executive member, David Hinds told Demerara Waves Online News that the APNU meeting slated for July is a major outcome of the talks between delegations led by President David Granger and WPA Chairman, Desmond Trotman. “Because the APNU’s Councils have not met in almost two years and so we feel that a decision that such a meeting is necessary is a major breakthrough,” Hinds said. WPA sources have told Demerara Waves Online News that the party felt offended that it was not consulted properly before the reassignment of Roopnaraine. The Working People’s Alliance (WPA) remains a strong an integral member of the Coalition Government and Minister of State, Mr. Joseph Harmon said that Saturday morning’s meeting between executive members of the party and President David Granger has served to reaffirm that the system of communication among parties will be reinforced and will remain strong. The Minister of State made these comments in an invited comment following the meeting at State House, which saw the participation of nine members of the WPA executive after they had asked to meet with the Head of State, following the reassignment of former Minister of Education, Dr. Rupert Roopnarine to the Ministry of the Presidency with specific responsibility for the public service and a Department within that Ministry to oversee innovation and reform in the education sector. While the WPA had complained about the lack of consultation on the decision, the President reportedly indicated that there had been consultation and that there is an existing system of communication between Government and the political parties that make up the Coalition. Describing the meeting as cordial, the Minister also said that the WPA executives expressed that they understood that it is within the jurisdiction and authority of the President to assign or reassign Ministers as needed. “His Excellency was very clear on the rearrangement, which needs to stay in place so that our Coalition Government remains very strong and that is to say that all the parties within the Coalition Government; the six parties, that we hold all of them as integral to the formation of our Government and we will continue to communicate with those parties… I think that the respect for the President’s decision was there throughout and, quite contrary to what some people out there are saying, the WPA is a very strong part of the partnership and a very strong part of our coalition Government,” he said. WPA was represented at the meeting by Dr. Clive Thomas, Dr. David Hinds, Dr. Wazir Mohammed, Dr. Rishi Thakur, Ms. Tabitha Sarabo-Halley, Mr. Desmond Trotman, Mr. Tacuma Ogunseye, Mr. Jinnah Rahaman and Mr. Ali Majeed. 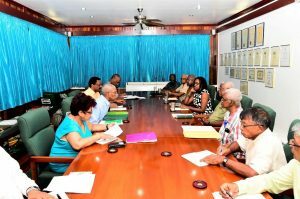 President Granger”s delegation included APNU General Secretary Joseph Harmon, People’s National Congress Reform (PNCR) Chairman Basil Williams and PNCR Assistant General Secretary Amna Ally. The PNCR-dominated APNU includes the WPA, The United Force, National Front Alliance , Guyana Action Party among others.